Personalized Any Photo Sherpa Blanket. 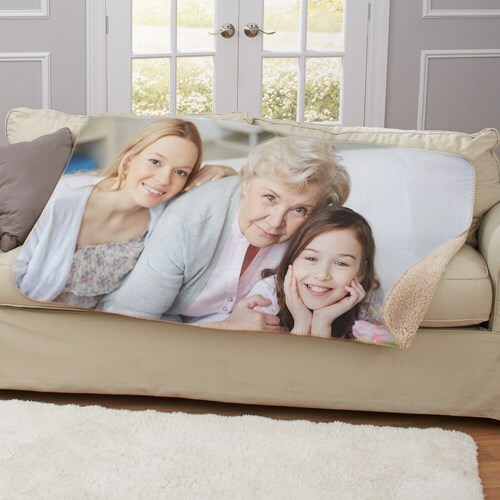 Accent your living room, family room or bedroom with photo Throw Blanket. A beautiful personalized gift which places your favorite digital photo in any room in the house. Create a lasting photo keepsake for Mom, Dad, Grandma or Grandpa with a recent baby photograph, photo of the kids playing in the backyard or perhaps a loving photo of your pet. Have your photo be a special keepsake from your special photo memories with a photo sherpa blanket. Sherpa is Soft and smooth mink touch front with tan Sherpa back, Yarn stitched edges, Made of 100% polyester, Approximate size: 37" w x 57", Machine washable in cold water. Tumble dry on low.